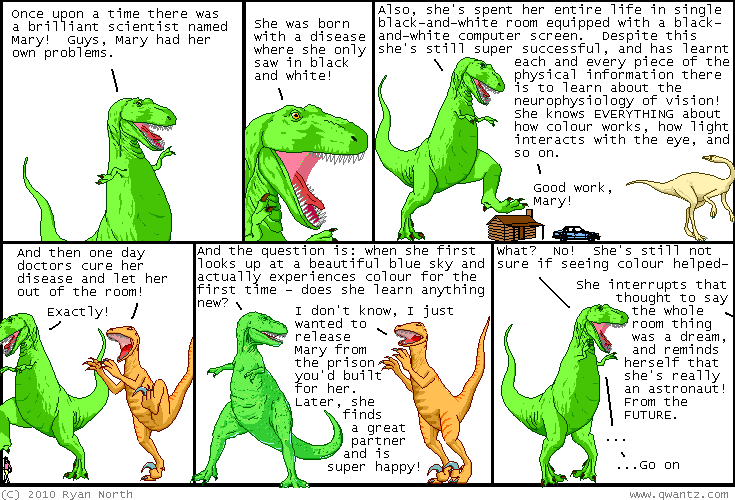 Dinosaur Comics - April 20th, 2010 - awesome fun times! April 20th, 2010: I just found out that Stanford's marching band turned their tubas into Dinosaur Comics to help win a Battle of the Bands and this is what I have to say to that: that it is TOTALLY AWESOME. Here's video of them in action - way to go Stanford! Also wow, thanks everyone who said they wanted a "THERE / now I'm not naked anymore" shirt from yesterday's comic! I got tons of requests for it, and I will see what I can do! One year ago today: YOU ARE SPECIAL: a "web" "card"